Jonathan Paul frankly admits it was never his intention to follow his father’s footsteps into the construction business. Slugging it out on weekends and summers as a teenager working at his dad’s firm in Saskatoon inoculated him from that particular pursuit. But life is full of twists and turns. And now that he finds himself co-owning a successful construction business with his brother Michael, Paul has a few words of advice for other young entrepreneurs in Saskatchewan. The “program’’ is the Raj Manek Mentorship Program, a volunteer based charitable organization named after a senior official in the Saskatchewan Ministry of Economic Development who mentored many entrepreneurs -- often in his spare time -- before his unexpected death in 1996. The program is administered by his widow Kanchan Manek, in cooperation with the Saskatoon, Regina and Saskatchewan chambers of commerce. Paul had studied architectural technology and expected to work in that area, while his brother pursued a career in lacrosse. Neither of them was interested in construction. But when Michael moved back to Saskatoon, the two brothers decided to start their own construction business rather than go back to work with their father. 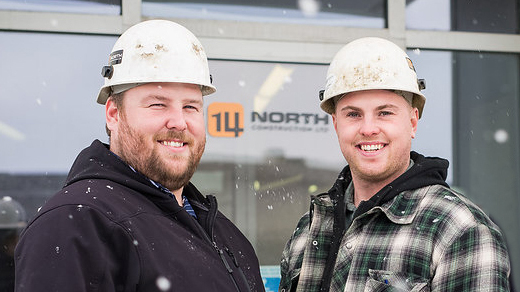 “We just started cracking away at small projects and worked our way up.’’ After a hiatus from the construction business they launched in 2009, the two men established 14North Construction in 2014. They’re now in the middle of a second, one-year mentorship arranged by Manek with the assistance of Kent Smith-Windsor of the Saskatoon Chamber of Commerce. This time their mentor is a Mark Loeppky, a young Saskatoon businessperson involved in marketing a group of businesses, something else the brothers see in their future. “Darrel and Mark are two completely different personalities to start with,’’ says Paul, adding the latter is closer to his age. “Where Darrell was a big-picture guy, Mark gives us really technical advice, much more detail oriented.’’ Paul says Loeppky has provided advice on moving into new markets and how to market themselves once they’ve arrived. For her part, Manek says credit for the mentorship program must be given to the chambers of commerce in Saskatchewan for agreeing to collaborate in the very successful program she administers. “It was the business communities who wanted to do something and we started the program in Raj’s memory.’’ Manek, who moved from Saskatoon to Edmonton in 2007, says she uses a hefty questionnaire to determine details of the protégé’s business plans and the type of mentoring assistance needed, to assist her in finding a suitable mentor. The program was established in 1998 and operates through an annual fundraising banquet -- PotashCorp has been a strong supporter for the past several years. The program has produced more than 400 years of mentorship relationships and its protégés have a high business success rate.